I never said, 'I want to be alone.' I only said 'I want to be let alone!' There is all the difference. There are some who want to get married and others who don't. I have never had an impulse to go to the altar. I am a difficult person to lead. How can one change one's entire life and build a new one on one moment of love? And yet, that's what you make me want to close my eyes and do. Why haven't I got a husband and children?" mused Greta Garbo to the Dutchess of Windsor, "I never met a man I could marry. I'm not always sincere. One can't be in this world, you know. She was nominated for an Academy Award again that year for her performance in Romance (1930). She lost out to Irving Thalberg's wife Norma Shearer who won for The Divorcee. Garbo had an older brother Sven Alfred (1898–1967) and an older sister Alva Maria (1903–1926). Her performance caught the attention of Louis B. 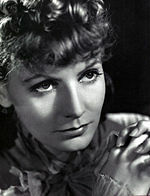 With her first talking film Anna Christie (1930) Greta Garbo received an Academy Award nomination. She also won the New York Film Critics Circle Award for Best Actress for both Anna Karenina (1935) and Camille (1936).